Robotech like Transformers has a huge fan following that grew up loving all of the cartoons and figures that came out. With the uber success of Transformers it only seems natural that films like Voltron and Robotech would naturally begin development. Producer Chuck Roven has some inside scoop on Robotech and what is exactly happening with the film. Roven tells IESB at the Spike TV Scream Awards that they are currently writing the script now for the film and want to begin shooting next year. "Were just working on the script right now," he said. Roven added, "I'm hopeful that we'd start shooting sometime next year, that would be great." Warner Brothers is co producing the film alongside Maguire Productions, which is Tobey Maguire's production company. 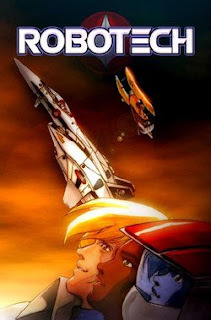 Back in 2007 Maguire had commented on the film, "We are very excited to bring 'Robotech' to the big screen. There is a rich mythology that will be a great foundation for a sophisticated, smart and entertaining film." It has been rumored that Maguire has been eyeing the lead in the film. IESB asked Roven if Maguire would in fact be the lead in the role and he replied that Maguire is meerly producing the film for now. "Right now, Tobey's just a producer on it, like myself." One would only hope that the creative team behind Robotech would take from the original concept designs. Roven was asked if the film will have the same look and hold true to the original Robotech robots. He replied, "Certainly were going to take some inspiration from all that because, you want to make sure you know from whence the roots came from but uh...I can't really tell you...we haven't even begun production design." (How great is "From whence the roots came from?") I would think with Maguire on as a producer, he will hold true to the original design of Robotech. Lastly Roven talked about the story and if Robotech will take place exclusively on Earth. He made it clear that while the initial attack happens on Earth, but the story won't necessarily stick to only Earth. Roven said, "Certainly we all know that the trigger mechanism is an attack on Earth."